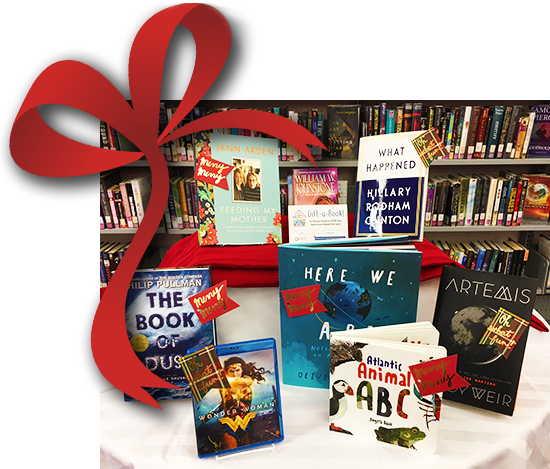 The 2018 Gift-A-Book Campaign has come to an end, but the library greatly appreciates donations any time of year! Your donations help us build our collection, and may be made at any of our branch locations or online. Thank you for your support! Gift-a-Book Campaign This holiday season, give the gift of reading! Help our library continue to give the gift of reading this holiday season! A great way to give a gift to your friends and family & benefit the communities we serve! Sponsoring a library book (or movie DVD, or TV series box set), is as easy as dropping by your local library, or browsing our online wishlists of books and other items. Pick a title, make your donation, and the library will purchase your chosen book! At each library location there will be a small display of books, movie DVDs and TV series box sets, available for you to choose. In addition, we have carefully crafted Wish Lists of books (and DVDs) for folks to choose from, in a range of genres. And if your perfect book idea isn’t on the Wish List, please let us know - we happily take suggestions! You will receive an income tax slip for the amount of donation given. You can choose to be first in line to read the book, or watch the movie or TV series box set. A personalized bookplate is placed on the sponsored item, recognizing your gift or the person you wish to gift the item to. A gift card for you to use as a stocking stuffer, to let your lucky booklover (or movie fan) know that you have sponsored a library item for them. For more information about Gift-a-Book, please contact your local library branch, or Library Headquarters at 902 755-6031, toll free 1-866-779-7761. "The greatest gift is a passion for reading"
We welcome suggestions for purchase outside of these lists, as well as general donations toward the collections budget. Visit your local library to adopt a book and arrange for your bookplate and tax receipt. For online giving, don't forgt to include the title(s) you wish us purchase in the "Message" box!